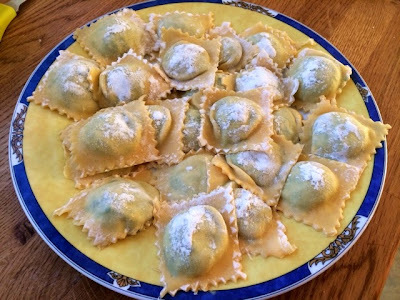 Ravioli, for me, is on if those dishes I enjoy spending the time lovingly making and preparing just as much as I enjoy eating it. Of all the things I love to cook and and/or bake, I honestly don’t think I love any of them more than I love making pasta and to me spending a weekend afternoon preparing what must ultimately seem to many like a relatively simple dish, is really very relaxing and satisfying. I’m quite a busy person so I don’t often get the chance to pull out my pasta machine and when I do it seems like a real treat. 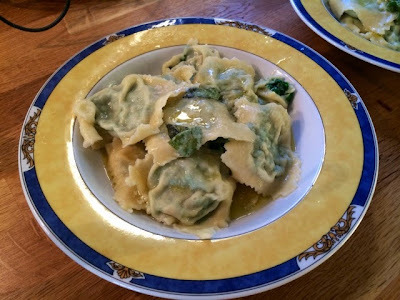 One of the best things about Italian cooking is that the best dishes are so great because they are so simple. A few quality ingredients expertly combined goes a long way. 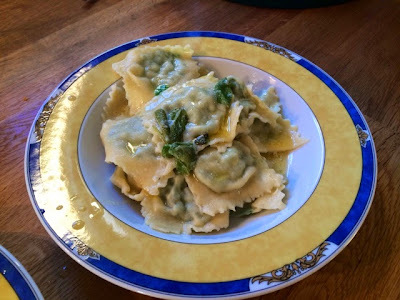 Spinach and ricotta is a classic combination and had to be the filling of choice for this dish, along with the sage butter it brings a lightness and a freshness to this pasta dish which is hard to beat. 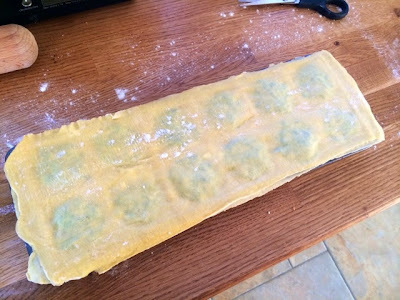 You don’t need lots of fancy equipment to make your own pasta, I used a rolling pin for a long time before I got a pasta machine for my birthday one year and pastry and cookie cutters are ideal for making ravioli shapes. 1. Make your pasta according to my fresh pasta recipe. Once it has rested in the fridge, roll it out into paper thin sheets using either a rolling pin or pasta machine. 2. 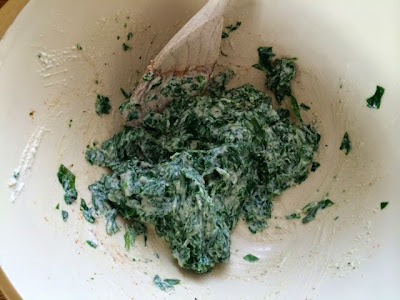 Blanch the spinach by placing in a colander in the sink and pouring a kettle full of boiling water over it. Dry using paper kitchen towels and squeeze out as much of the excess liquid as you can, you don’t want your ravioli filling too soggy. Roughly chop when dried. 3. Mix together the spinach, ricotta and nutmeg for the filling, season with salt and pepper. 3. 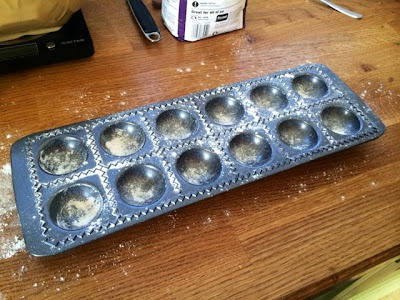 If you’re using a ravioli tray make sure it is well floured before use. 4. Lay a sheet of pasta over the tray, dipping it down into the wells. 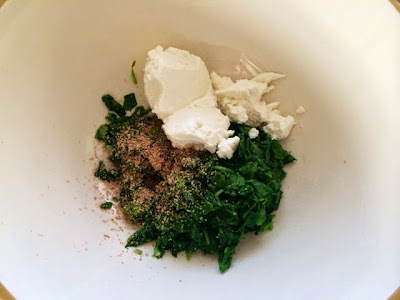 Fill each well with a teaspoon of the spinach and ricotta mixture. 5. Brush the edges with a little water using a pastry brush and lay another sheet of pasta on top. Try to seal as tightly as possibly to ensure no air bubbles. 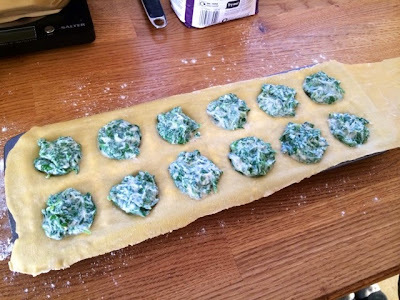 Roll over the top with a rolling pin to cut the ravioli shapes out. Turn out of the tray and separate. Ensuring everything is well floured so none of your ravioli stick together. 6. 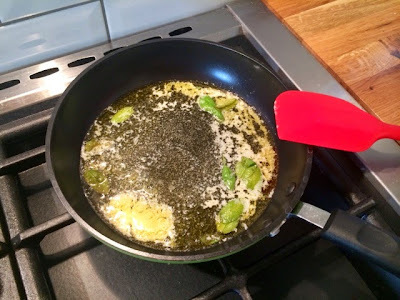 Melt the butter in a small pan with the sage leaves. 7. 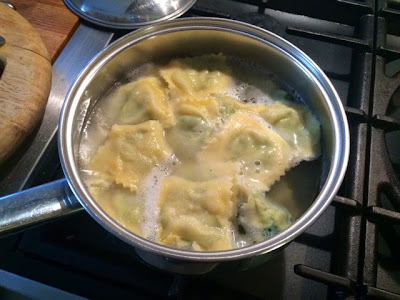 Bring a pan of salted water to the boil and drop in your ravioli. They will only take 2-3 minutes to cook and will rise to the top of the pan when done. 8. Toss your ravioli in the sage butter and serve.